The municipality of Medina del Campo (21,594 inhabitants in 2012, therefore the 3rd most populous municipality in the province; 15,327 ha; tourism website) is located in the south-east of Valladolid Province, 50 km from Valladolid. Medina del Campo, although already settled in the Age of Iron and in the Roman times, bears a name of Arab origin; "medina" means "the oldest part of a town". Medina del Campo was mentioned for the first time, as Metina, on a document dated 1170. The town was established during the re-settlement campaign organized by King Alfonso VI (1040-1109). The charter granted to the town was confirmed in 1258 by Alfonso X the Wise (1221-1284). The Cortes of Medina were gathered for the first time by Ferdinand IV (1285-1312). Medina del Campo is nicknamed the Town of the Fairs. Ferdinand I of Aragón (1380-1416), born in Medina del Campo, is considered as the founder of the fairs (1404), probably on the model of those established in Cuéllar in 1390. His wife, Eleanor of Aragó n (1402-1445), lord of Medina, signed on 12 April 1421 the first Ordinances regulating the fairs, which were granted in 1491 the title of General Fairs of the Kingdom by the Catholic Monarchs. Beside the Royal privilege, the fairs were favoured by the location of Medina del Campo on the Toledo-Burgos road, at the crossing of roads to Valladolid, Zamora, Salamanca, Segovia and Ávila. Two fairs of 50 days each were organized every year in May and October, respectively. Originally free markets, the fairs progressively attracted changers and bankers from Antwerp, Lyon, Geneva, Florence and Lisbon. The local tradition says that bills of exchanges were invented in Medina del Campo in the 16th century, although earlier examples of such bills are known in Italy. The fairs declined in the second half of the 16th century following the economical crisis caused by the indebtedness of the Crown. The break of trade with Flanders and the transfer of the Court to Madrid caused in October 1594 the suppression of the fairs; attempts of re-establishement failed during the reign of Philip V (1700-1746). The old downtown that developed in the 15th-16th centuries was registered as an Historical and Artistic Monument in 1978. Regional fairs were founded in Medina del Campo after the inauguration of the railway line (1860); a weekly cattle market was established in 1870, as was a grain market in 1871. The San Antolín Main Fair was created in 1873; its duration was extended in 1878 from 6 to 8 days, as it is today. The blaze that destroyed in 1492 some 260 buildings of Medina del Campo prompted Isabel the Catholic to edict the "Fire Ordinances". The queen dicted her last will on 26 November 1504 in the palace known since then as "Palacio Real Testamentario" (Palace of the Royal Last Will). Medina del Campo took the party of the Comuneros revolted against Charles I, refusing in 1520 to deliver the cannons required to attack Segovia. As a retaliation, the Royal troops burned down more than 900 houses. 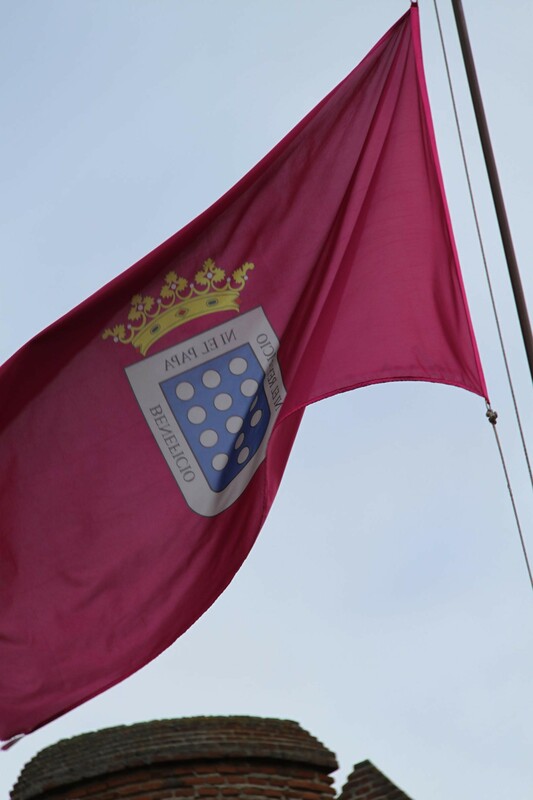 The flag of Medina del Campo (photo, photo, photo, photo) is purple with the municipal coat of arms in the middle. The coat of arms of Medina del Campo is "Azure 13 roundels argent 3 + 3 + 3 + 3 + 1 a bordure argent inscribed 'NI EL REY OFICIO NI EL PAPA BENEFICIO' in letters sable. The shield surmounted by a Royal crown open". The origin of the 13 roundels involves an old legend featuring Luis Díez, captain of the militias of Medina del Campo. During the disaster of Alarcos, a battle lost on 19 July 1195 by King Alfonso VIII to Al- Mansur, Díez could not prevent his banner to be captured by the Moors. For such a disgrace, he vowed not to come back to Medina until the banner is retrieved; accordingly, he spent the rest of his life in a small hut located out of the town. When about to die, he asked his son Sancho to fulfil his promise. A few years later, Sancho commanded the Medina troops, which, without any banner, defeated the Moors near Ronda (Andalusia), together with the Ávila troops (in fact, Ronda was re-conquered only in 1485!). In the abandoned Moorish camp, the assaulters found two banners; Díez took the blue banner charged with 13 white roundels and brought it back triumphally to Medina del Campo. To celebrate the fulfilment of the vow, Medina superseded its old banner, made of yellow and blue bends, with the new one. The motto on the bordure reads "Neither the King has office nor the Pope has benefice", reflecting the civil and ecclesiastic autonomy once enjoyed by the town (description). The old chronicles present Medina del Campo before the Muslim invasion as a kind of small republic, in which the power was exerted by the people, the kings having no jurisdiction on any matter. This autonomy was confirmed after the reconquest by the establishment of the Lineages, which, however, transferred the power to a limited number of families. Medina subsequently lost its full civil autonomy, at least in 1170 when King Alfonso VIII granted the town to Queen Consort Leonor of England. The town was then granted by John I to the Duchess of Lancaster and by Ferdinand I to Eleanor of Aragón. The Lineages were maintained, but they decreased even more the civil autonomy of the town by asking in 1407 the King to appoint a "corregidor" to rule the town and an "alcalde" to run the fortress. Those rulers defended the interests of the king rather than those of the the town, so that the civil autonomy of Medina del Campo had completely vanished in the 18th century. The ecclesiastic autonomy of Medina del Campo resulted, more or less, from the unresolved status of 16 "median" parishes disputed between the Archdeaconry of Olmedo, which belonged to the Diocese of Ávila, and the Archdeaconry of Medina, which belonged to the Diocese of Salamanca, and, much later, to the Diocese of Valladolid. The disputed parishes were incorporated into the Land of Medina, both their ecclesiastic status remained indeterminate: they were ruled the one year by Ávila and the next year by Salamanca. The bishops in charge had little to decide about the ecclesiastic affairs in Medina del Campo but to approve the local decisions, as confirmed in the Bull signed by Pope Sixtus IV in 1480 to allow the building of the collegiate church. Permanent struggle between the parish and the collegiate church for precedence in processions and election of abbots required in 1568 the intervention of King Philip V. As for the civil autonomy, the ecclesiastic autonomy of Medina was then significantly reduced; the inhabitants of the town attempted to prevent the direct appointment of a vicar by the Bishop of Valladolid, to no avail. The last local privileges were eventually suppressed by the Concordat signed in 1851. A Spanish national flag is hoisted over the highest tower of the collegiate church of Medina del Campo. The flag is changed every year for the inauguration of the San Antolín Festival by members of a local association (Lowering of the flag, 31 August 2012; Hoisting of the flag, 1 September 2012).